We’d love your help. Let us know what’s wrong with this preview of Empires of Food by Evan D.G. Fraser. We are what we eat: this aphorism contains a profound truth about civilization, one that has played out on the world historical stage over many millennia of human endeavor. Using the colorful diaries of a sixteenth-century merchant as a narrative guide, Empires of Food vividly chronicles the fate of people and societies for the past twelve thousand years through the foods We are what we eat: this aphorism contains a profound truth about civilization, one that has played out on the world historical stage over many millennia of human endeavor. Using the colorful diaries of a sixteenth-century merchant as a narrative guide, Empires of Food vividly chronicles the fate of people and societies for the past twelve thousand years through the foods they grew, hunted, traded, and ate—and gives us fascinating, and devastating, insights into what to expect in years to come. In energetic prose, agricultural expert Evan D. G. Fraser and journalist Andrew Rimas tell gripping stories that capture the flavor of places as disparate as ancient Mesopotamia and imperial Britain, taking us from the first city in the once-thriving Fertile Crescent to today’s overworked breadbaskets and rice bowls in the United States and China, showing just what food has meant to humanity. Cities, culture, art, government, and religion are founded on the creation and exchange of food surpluses, complex societies built by shipping corn and wheat and rice up rivers and into the stewpots of history’s generations. But eventually, inevitably, the crops fail, the fields erode, or the temperature drops, and the center of power shifts. Cultures descend into dark ages of poverty, famine, and war. It happened at the end of the Roman Empire, when slave plantations overworked Europe’s and Egypt’s soil and drained its vigor. It happened to the Mayans, who abandoned their great cities during centuries of drought. It happened in the fourteenth century, when medieval societies crashed in famine and plague, and again in the nineteenth century, when catastrophic colonial schemes plunged half the world into a poverty from which it has never recovered. And today, even though we live in an age of astounding agricultural productivity and genetically modified crops, our food supplies are once again in peril. To ask other readers questions about Empires of Food, please sign up. The most comprehensive book to date on the history of food systems and their important (and usually neglected) role in the collapse of civilizations. "The lesson from history," the authors write, "is that big civilizations are built on ground no firmer than the mud under their rice paddies. They, and we, are slaves to food." Food empires? The authors are talking about the networks of a civilization's farms, plantations, orchards; its imports from abroad; its processing plants; and its distributio The most comprehensive book to date on the history of food systems and their important (and usually neglected) role in the collapse of civilizations. "The lesson from history," the authors write, "is that big civilizations are built on ground no firmer than the mud under their rice paddies. They, and we, are slaves to food." Food empires? The authors are talking about the networks of a civilization's farms, plantations, orchards; its imports from abroad; its processing plants; and its distribution channels. The larger and more complex the civilization, the more complex the food networks must be--to the point where they deplete existing resources of soil and water, then falter, then fail. Interacting with climate variables and local geological factors (volcanoes, earthquakes), food empires are far more fragile than they appear to the people who live within them, who often take their available food for granted. When these systems fail, the civilization begins to fall apart, usually with a whimper rather than with a bang. And our own industrial food empire? Despite our "advances" in technology, our food supplies are as fragile as those of the Romans, Mayans, or medieval Europe. But now, the problems are global, and every nation under the sun is facing soil depletion, water issues (including fertilizer pollution), and a dangerous dependence on limited fossil fuels to grow, process, and transport food. The result? "Modern agribusiness has the potential to translate a dry month in Brazil into red ink on a ledger in China into an empty shopping cart in New Jersey. There are no buffers left." And no easy answers. Local food, slow food, bioregional systems that "nest" within a global trading network. But "easier posited than done," as the authors admit. What's really needed: a public insistence that their politicians begin to acknowledge and address these crucial issues. Again, easier posited than done. What I like about this book: its breadth, inclusiveness, new-paradigm thinking, engaging writing. I also admire the authors for not trying to pull last-chapter rabbits out of the hat when it comes to solutions. Their message: don't expect answers to be handed to you on a plate. What I dislike about the book: its hop-skip-jump presentation, which reminded me of the TV series "Connections." But even this choppy organization has its advantages: readers must actively participate in the authors' arguments in order to follow them. Lazy or uninvolved readers won't want to bother--but then, they're probably not the authors' intended audience. The basic outline of the book is good and the authors cover a lot of material in a basically competent way. Furthermore, this is an important subject. The positives of the book are that they basically discuss the history of food during all of world history. I especially liked the discussion of the guano wars (or near wars) of the 19th century. They discuss key issues like "fair trade" and "organic." Also, the book is entertainingly written. You won't fall asleep. I thought that their conceit of f The basic outline of the book is good and the authors cover a lot of material in a basically competent way. Furthermore, this is an important subject. The positives of the book are that they basically discuss the history of food during all of world history. I especially liked the discussion of the guano wars (or near wars) of the 19th century. They discuss key issues like "fair trade" and "organic." Also, the book is entertainingly written. You won't fall asleep. I thought that their conceit of following Carletti's adventures around the world was interesting. The main negative of the book is that it is prone to glittering generalizations. Sometimes these generalizations are arguable but controversial, such as their assertions about the fall of the Roman Empire being connected to food, but you get no indication that they are saying something that really could be argued either way. (Joseph Tainter, in "The Collapse of Complex Societies," argues that it has to do with the diminishing returns on looting and pillaging, which was basically the Roman economy.) At other times, the generalizations are really more questionable or flat out wrong. "Even the most ardent peak oilers tend to overlook the fact that fossil fuels make our food," they say on p. 245. Well, I am a regular reader of TheOilDrum.com and I can say that this fact is quite well understood and frequently discussed. At another point (can't locate the page reference) they state that industrialized agriculture has been around for 100 years, whereas it is actually only since World War II that yields have really taken off and factory farming of animals has become entrenched. The second negative is that several important issues are omitted. Not discussed is anything about eating high or low on the food chain. Also not discussed is the key impact of livestock agriculture on soil resources -- much of the American southwest, and North Africa, was made into desert through overgrazing, and this is historically an important issue. Soil erosion is discussed but I thought they could have done a lot more. Also, the price elasticity of food (like that of oil) is very low, another key fact in understanding food economics which is alluded to but never explained. ("Low price elasticity" means that the demand for food is pretty much constant no matter what the price. No matter how cheap that pizza is, you can only eat so much.) These are key omissions for me and a complete book on the history of food and civilization really should discuss them. "Evan Fraser and Andrew Rimas vividly recreate centuries of spice-filled ships and grain silos to show that while the pen and the gun may be the visible tools of diplomacy, the knife and fork are often the true instruments of human change. Their unsentimental march through our history and into the future reaches a conclusion that is both inspiring and unnerving: civilization is what we eat." This book will be interesting to anyone who is a fan of learning food history; if you liked Omnivore's Dilemma then I think this will be right up your alley. The authors write history that flows like poetry and the story is told in a very interesting and compelling way. My one complaint is that it isn't written chronologically, which normally does not bother me but in this case didn't seem to contribute to the story and so was distracting to the point. I was loath to put this book down once I started it. It held my interest like a well-crafted novel would- for the most part. The author’s premise is that empires expand when they have good sources of food (mainly grain), and then, when the food sources fail the empire collapses. They present the Mayans, Mesopotamia, the Romans, the British Empire, modern China, and modern America among others, and they paint a pretty scary picture. Sadly, their scholarship doesn’t match their writing. The Britis I was loath to put this book down once I started it. It held my interest like a well-crafted novel would- for the most part. The author’s premise is that empires expand when they have good sources of food (mainly grain), and then, when the food sources fail the empire collapses. They present the Mayans, Mesopotamia, the Romans, the British Empire, modern China, and modern America among others, and they paint a pretty scary picture. Sadly, their scholarship doesn’t match their writing. The British Empire didn’t fail because of a shortage of grains. Some of the dates given are just wrong; in at least one case, that makes what they are saying impossible (that a certain event caused something). The book jumps around in time and place; I found it rather jolting at times to make the connections. For some reason, they felt they could bind a lot of the events together with the story of the world roaming trader Carletti, but they don’t even give him a continuous narration. He really had nothing to do with their thesis. What was good about it? It does examine food surplus and scarcity. To be a food empire, the empire must be able to produce or capture a surplus of grains. They must be able to ship it to all its area, and trade it for other things, both necessities and luxuries. Having more food than your own population also gives a society another, very important, thing: when there is enough food that not everyone has to be a farmer, people can do other things, like learn to read and write, become artisans, and go exploring. Being able to have a non-farmer class gave us civilization. They also go over why the food surpluses ceased to be. Irrigation that created over saline soils, loss of soil nutrients, loss of soil itself due to erosion, lowering of average temperatures by even one degree makes plants take longer to ripen grain, lack of rain- all these things can create disaster. And we are facing that again today: today we face climate change, soil erosion, drought, and the fact that the vast majority of grain growing (and, hence, meat producing) relies on petroleum inputs- and we are fast running out of petroleum. The authors do not have an answer to our possible/probably plight. One thing they do suggest isn’t something that will work for most areas of the world: becoming locavores. Eating only foods grown within a circumscribed area at least remedies the amounts of fuel used to truck and process foods. Now, a big city, with all its suburbs, covers a huge area with blacktop and concrete and will have few areas for growing foods- and it takes a LOT of area to grow grains and frankly no one wants a pig farm next door. Our area, despite being rural, cannot successfully feed itself. The soils are not rich enough to support much beyond grass hay and cattle. The growing season is too short to ripen grain a lot of years- not to mention many fruits and vegetables. It’s possible on a small scale to ripen peppers and tomatoes by protective coverings but it would take a LOT of greenhouses to feed the county year round. What this book does is point out a lot of different aspects of food supplies and make you think about them. For that I give it four stars. I didn't enjoy this book, but maybe it's mostly because I've already read at least 10,000 books about food, history, sustainability, the environment, organics, and every permutation of those subjects. That said I did learn a couple of new things so it wasn't a total waste of time. Fraser and Rimas try to pepper the narrative with tales of Francesco Carletti, a 16/17th Century entrepreneur who traveled the world to make and lose a fortune on the food trade. I found the story interesting but largel I didn't enjoy this book, but maybe it's mostly because I've already read at least 10,000 books about food, history, sustainability, the environment, organics, and every permutation of those subjects. That said I did learn a couple of new things so it wasn't a total waste of time. Fraser and Rimas try to pepper the narrative with tales of Francesco Carletti, a 16/17th Century entrepreneur who traveled the world to make and lose a fortune on the food trade. I found the story interesting but largely irrelevant to most of the rest of the book, more like it was just used as a lead-in to chapters to keep a narrative flow instead of enhancing it. The structuring of the book isn't chronological or geographical so the book kind of lacks a stable back bone. Finally, I found the last part of the book (and the conclusion) to be a let-down. The authors talk about the current food empire and how we're doomed to fail, mention things like organics and Slow Food, say that they're basically fashion statements, but maybe could do something to help. I feel like they make bad conclusions with decent data, and I'm not really sure why their conclusions fall so flat, but they do. This book was very disappointing. It makes an argument for a Malthusian trap based on agricultural collapse, and does so poorly. The argument is based around the fact that there have been historic agricultural collapses, but ignores the larger long lasting, and ongoing trend toward both an increase in agricultural productivity and total output. The authors mention relevant factors such as top soil loss, soil depletion, and soil salinity, however they seem to be unaware of how these are mitigated by This book was very disappointing. The authors mention relevant factors such as top soil loss, soil depletion, and soil salinity, however they seem to be unaware of how these are mitigated by modern agriculture. Neither author seems to have a background in agriculture, or much knowledge of it. Another annoyance is that if you check their sources, they frequently reference secondary sources. The only redeeming features of the book were the historic anecdotes, which were entertaining. 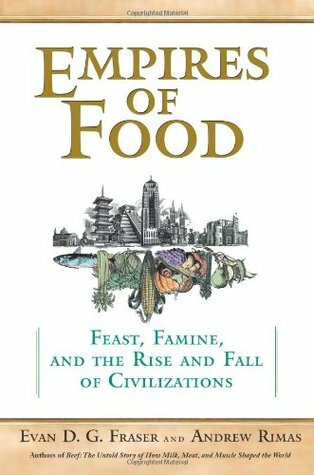 "Empires of Food: Feast, Famine, and the Rise and Fall of Civilization" by Evan D.G. Fraser and Andrew Rimas discusses food related issues through out history. The book generally follows a format where each chapter covers an historical anecdote and then has a short discussion on some general historical food related issue, such as soil depletion. Often the anecdotes are from the world travels of a 16th Century European merchant. The book certainly has tremendous color, good writing, and global view "Empires of Food: Feast, Famine, and the Rise and Fall of Civilization" by Evan D.G. Fraser and Andrew Rimas discusses food related issues through out history. The book certainly has tremendous color, good writing, and global view. And the authors are clearly highly knowledgeable in their field. But to me, that the book was trying to do too much. I felt so on several grounds. First, the diaries of the 16th century merchant as told by the authors was tremendously attractive and well done. That subject itself, and the newly opening world (from a European perspective) could have made an excellent story, all by itself. I felt the same way regarding the history of food as recounted in the book. Second, the various end of the chapter discussions on food issues throughout history, each could have made an excellent book. However, the short disconnected dissertations appeared to me to often be just summaries of the conclusions. They did not contain thoughtful background and context. In the end, many came across to me as disconnected random preachy after thoughts. Which, I found unfortunate, as the issues are real, and true concerns. Third, it seemed to me that some of the food issues brought up, may have been arguments against ideological opponents. I do not claim to know which of the sides is correct. I do feel that the authors may have done their arguments a disservice in handling them in such a terse and disconnected way. Fourth, often I found it difficult to find a connection between the historical anecdote presented in a chapter and the food issue following it. I liked "Empires of Food", because it provides a good-to-read introduction into our current problemn of food production and consumption, giving a lot of thought on how to change your own attitude towards food and agricultural goods. The historical background is well researched, although as an archaeologist I had some serious problems with the writing of these historical parts that seemed to me a little bit too flimsy and easy going. I know, in order to make other people understand the essence of I liked "Empires of Food", because it provides a good-to-read introduction into our current problemn of food production and consumption, giving a lot of thought on how to change your own attitude towards food and agricultural goods. The historical background is well researched, although as an archaeologist I had some serious problems with the writing of these historical parts that seemed to me a little bit too flimsy and easy going. I know, in order to make other people understand the essence of an historical situation you have to abbreviate complicated facts into a shortened version, but some sentences like "there was no hierarchy steeper than that of parent and child" really made me shiver. That is simply not true and I would have expected that the authors could find expressions a little bit more detailed to refer to these specific historical realities. But nonetheless when it comes to historical background and its relationship with todays problems in food production and consumption, this is really a great book to read. I learned a lot of facts about today´s agriculture and its recent history in the last 200 years and it made me understand a lot of connections and evolutions over time. And I liked especially the last part, where "organic", "Slow" and "Fair trade" options are presented, critized and reviewed. This was really great and helped me a lot when thinking about our own consumption reality. Well-made book, with an excellent background on the history of food empires. This talks about agricultural history and how food made entire nations rise and fall. If this topic interests you, you will like to read the book. However, the end, where the authors talk about the current perspectives of our food empire is lacking. I believe the authors spent more time researching the history of food empires and are unable to foresee the future of ours. But their conclusion (that our food system will, e Well-made book, with an excellent background on the history of food empires. This talks about agricultural history and how food made entire nations rise and fall. If this topic interests you, you will like to read the book. it was a good book. it gave basic information about history of food and the way it was cultivated from ancient civilizations till the modern world. i found that there was many information repetition. plus it gave just brief insight on certain problems facing some countries and then i get surprised to find some of those problems discussed in depth on other chapters. in other words there was no balance of information. One of the most interesting books I have ever read. Most "this is why our civilization is unsustainable" books focus on pollution or global warming or dwindling oil supplies or disease outbreaks but this book looks at lessons from history and says that our current lifestyle/civilization will fail because at some point we will run out of food. As they note, this won't cause an Armageddon, more like a gradual shrinking of current population levels. Very well written history of food. It is great for anyone who is interested in the historical aspect of food, but not so good for anyone looking for a platform. The authors do a good job of delivering a cyclical history, but offer no insite in where we are heading, which is fine. If you shop local and have been, it isn't a surprising book, but for those who don't (who will never read the book anyway) it is eye opening. If you have any of your own cultural roots in the soil, if you know a farmer, if you wonder where your produce comes from, or simply if you EAT, this book will be of value to you. The authors clearly delineate the historical cycle that humans have committed against their environment over and over again. I wonder, can we learn from this history of empires, or are we doomed to repeat it? Well researched. This book combines history and food, two of my favorite things. It's an interesting follow up to "Guns, Germs, and Steel" as it explores the ancient food empires, then brings in the state of our food system today. The conclusion felt a bit loose and rushed, but I can't really disagree with anything that was written. The more things change, the more they stay the same. It isn't surprising that the GATT works the same way as the ancient Roman Empire, and other empires. The most interesting part for me were the last couple of chapters about Fair Trade, Organic agriculture, and the Slow Food Movement. The subject is treated in a pretty balanced way. I don't know if I agree that food is the main reason for empire expansion ambitions (rather than the fuel to make it happen), but the authors do make an interesting case. It will certainly change the way you look at the politics of food production, food distribution, and the environment. A very good book and well worth the read. The cynic in me though has trouble with this story of how human populations have grown throughout history, outstripped the land and subsequently contracted with massive drop offs in population...written by someone with three children. Pot calls kettle black. C'mon, ironic yes?? This book was very interesting. A bit sporadic, though. There was a running narrative throughout the book on some Italian merchant that always seemed like a stretch. Still, even that part was interesting. The book is very doom and gloom with an upbeat attitude. It's basically saying we're all going to die, but that's ok.
Enlightening, more from a historical perspective than a modern day one. So now I can better appreciate the food-distribution prowess of the ancients, but I don't think it'll help me keep food on the table should we have scarce times ahead. Pretty solid. They certainly have a message that they want you to see: our food system is unstable and in for a bad time, which has clear parallels in history. The style wore on my a bit, as they sort of harp on that theme a lot. Ah! We forget, since history is written by the winning great men, that we learn a chronicle of names and dates, when, as Evan Fraser make clear, food is the real driver of civilizations. And, their collapse. Great summary of historical food supply issues that mirror those we face in modern times. The incessant metaphors and similes were obnoxious, but in the end the data and stories made it a worthwhile read. Very interesting, but very depressing. I wish there was more positives and solutions scattered throughout, instead of just tacked on in the last chapter or so; as it was, I was just desperately looking forward to the historical trivia amongst all the doomsaying. The abundance or scarcity of food has been an important factor in the rise and fall of civilizations. The authors look at how technologial advances and soil depletion affect available food and thus the civilizations. Most of my professional work — which is either about analyzing data and writing papers for other academics or researching the history of food for popular books — comes out of my lifelong involvement with nature and the environment. This began in kindergarten, where I horrified teachers and amazed fellow students by bringing in pickled moose bits I had dissected with my naturalist father while acco Most of my professional work — which is either about analyzing data and writing papers for other academics or researching the history of food for popular books — comes out of my lifelong involvement with nature and the environment. This began in kindergarten, where I horrified teachers and amazed fellow students by bringing in pickled moose bits I had dissected with my naturalist father while accompanying him on summer field work. I followed this up as a teenager cleaning outhouses in national parks, and as an adult where I have dug soil pits in tidal swamps, collected tree samples by snowshoe in the dead of winter, climbed headfirst into bear dens (no bears there at the time), and did battle with fire ants in tropical jungles. I also spent formative summers working with my grandfather on a farm near Niagara Falls. More formally, I have a somewhat diverse academic background. Initially, I studied anthropology and Celtic studies at the University of Toronto and focused on the Irish Potato Famine. I then studied forestry and looked at agro-forestry in the tropics. I eventually earned a doctorate from the University of British Columbia, where I wrote my dissertation on sustainable agriculture. I’ve done a number of field work contracts, and these have taken me across the boreal forests of Ontario, the jungles of Central America, around the farmland of the Pacific West Coast, through urban Thailand, and into the Hills of Northern England. Currently, I do work with colleagues in Malawi, Ghana and Bangladesh as well as the UK and Canada. All of these projects have involved looking closely at how we produce food, exploring the amazing stories of the people who work the land, and worrying about what climate change might do to the food we eat. I have published approximately 45 scholarly research articles and book chapters on issues relating to sustainable agriculture, climate change, and "the food system." Links to these publications can be found at my personal website ( www.evandgfraser.com ). I’ve also written a number of policy briefs on environmental issues for senior Canadian politicians, including the Minister for Foreign Affairs, the Minister for the Environment, and the Prime Minister of Canada. I am part of the core team leading two of the United Kingdom’s key research projects on climate change, providing cutting-edge climate predictions and economic impact assessments that are commonly quoted in the media on both sides of the Atlantic. I receive regular invitations to lecture on these issues, and have recently spoken to audiences in Canada, France, Denmark, Austria, and Portugal, as well as to international audiences in Oxford, Bristol, Liverpool, Manchester, Sheffield, and Leeds. Although I’m Canadian by upbringing, I have spent considerable time in the UK. I work at both the University of Guelph (in Ontario) and the University of Leeds.